At EHS this year, we had five CSU coaches on the roster, and almost all of the athletes. I was head coach, and Maddy and Peter Nichol were also coaching. Doro and Gunther had been planning to come, but Gunther came down with a stomach bug the night before, so they scratched (rightfully so!). Super thanks to all the coaches (Jeff Campbell, Kiersten and Ryan Touponce, Mark Pollard, and team leader Susannah Wheelright) for managing the extra workload - we managed to get through all the tasks, but missed having the Kerns along! CSU sent a big contingent to EHS. I think everyone had at least one race that they can be proud of - look back at the goals you set for yourself last spring, and evaluate your races - did you meet your goals? What did you do well? What did you not do so well? Answering these questions can help you focus on what you'll improve for next year. 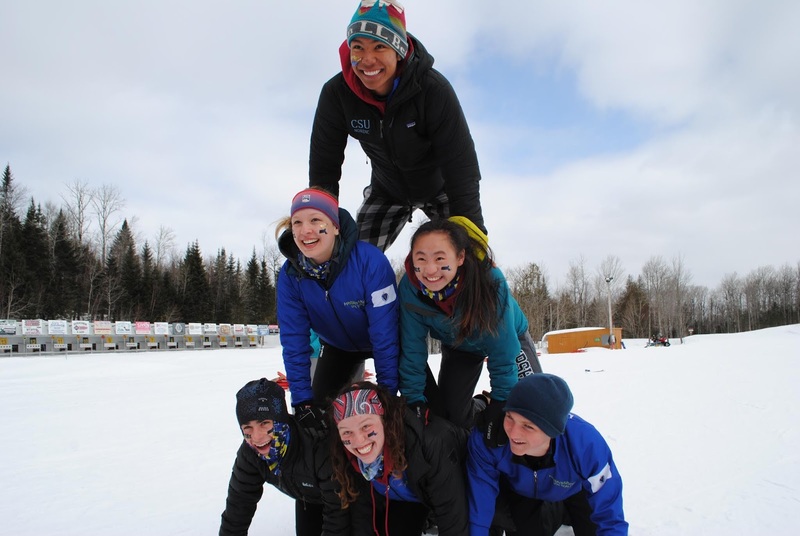 After a long bus ride, we made it up to Fort Kent on Thursday evening, in time for dinner at Rock's Diner, and then a team meeting and some dynamic movements in our hotel. Friday morning, we had a lot of time to kill, so started with a morning jog/walk before breakfast, a few hours of study hall, and finally time to head to the race course in the afternoon for the 5k skate race. Conditions were very wet, but not too slushy, and our skiers zipped around the course. The CSU boys were led by Linden in 4th place, followed closely by Connor in 6th, Devin in 7th, Julian in 16th, Lucas in 18th, Ben in 36th, Dwight in 42nd, and Patrick in 73rd. Really great to see these guys skiing so well! The girls were next, and it was more great performances - Mica in 2nd, Francesca in 13th, Tali in 22nd, Ella in 25th, Eva in 30th, Phoebe in 42nd, Flora in 54th, and Serena in 78th. That's some solid skiing. It didn't get below freezing overnight, but the course was in amazingly good shape considering the lack of cooperative temperatures for Saturday morning's 7.5km classic race. It was a pure klister fest, and we definitely hit the wax, with Linden winning in commanding fashion! In an exciting turn of events, we had five in the top fifteen, with Devin on the podium in 3rd place, Ben in 5th (despite losing a pole! ), Lucas in 6th, and Connor in 15th! 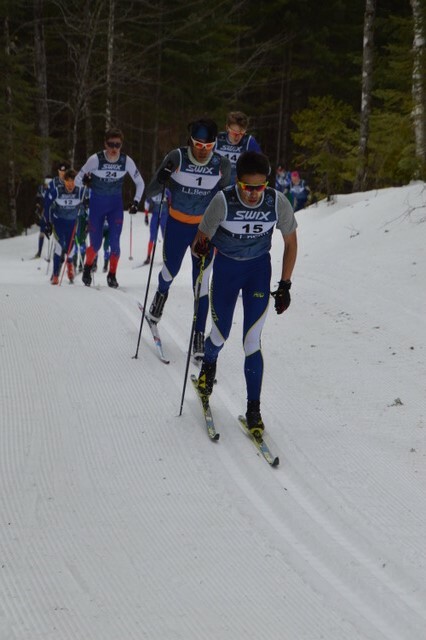 Julian was 30th, and I just want to say that I remember working with Julian on his classic skiing when he first started at CSU, and I would not have pegged him at the time as a top-30 at EHS classic skier - proof that hard work really can make a difference! Dwight was 68th, and Patrick 77th, not quite the races they were looking for, but sometimes ski races go that way. The girls also had a great day, with Mica ending up in 3rd, Eva in 5th, and Francesca in 8th after leading the chase pack in 3rd for much of the race. Rounding out the top 10 was Ella in 9th! Tali was close behind in 12th. 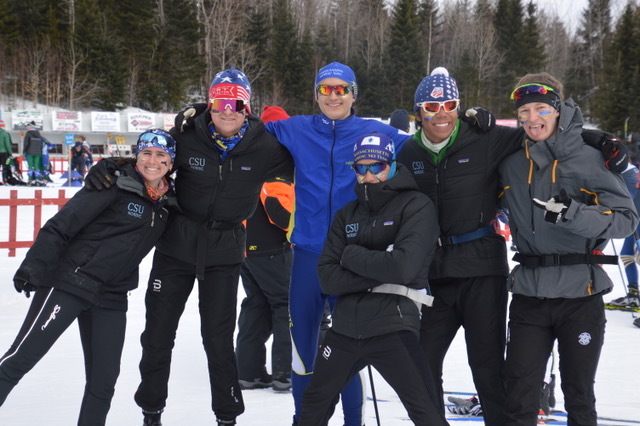 That is an impressive cluster of CSU skiers in the top 12! Flora used her great stride to ski to 40th, and Serena tried some different race tactics and ended up in 78th. 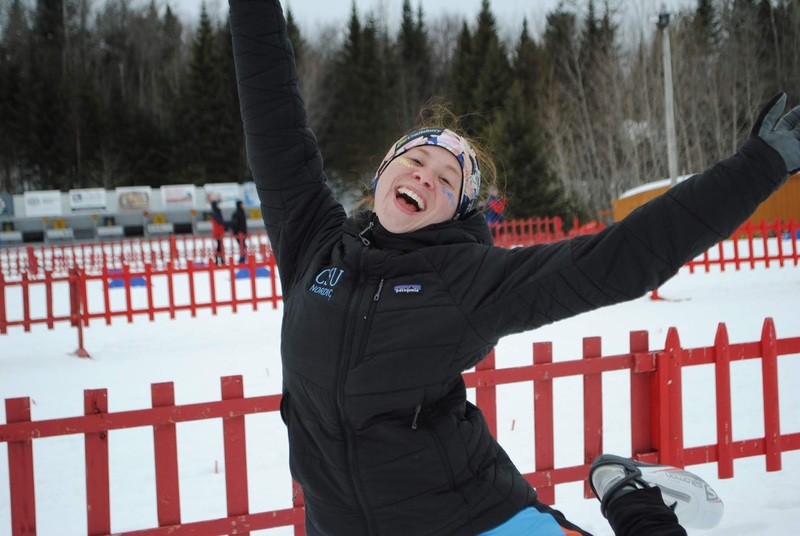 Special shout-out to Eva, who has been almost 100% sidelined this winter with injury; coming back for a 4th place at a championship race is really impressive. 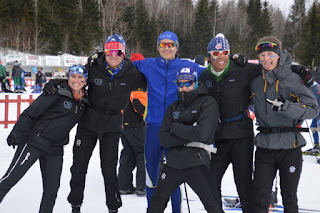 Every CSU skier was a point-scorer for Team Massachusetts! After the classic race, we had a 1.1km skicross race. This was a super fun course, with two banked turns, a drop jump, some rollers, and a bicycle pump section. The entire course was in the stadium, which made a great spectating experience. In the boys' race, our friend from western MA, Jakin Miller, won the race, by three seconds - very impressive! Devin was the top CSUer, in 5th, followed by Linden in 16th, Connor in 20th, Dwight in 21st, Julian in 29th, Lucas in 32nd, Ben in 41st, and Patrick in 53rd. 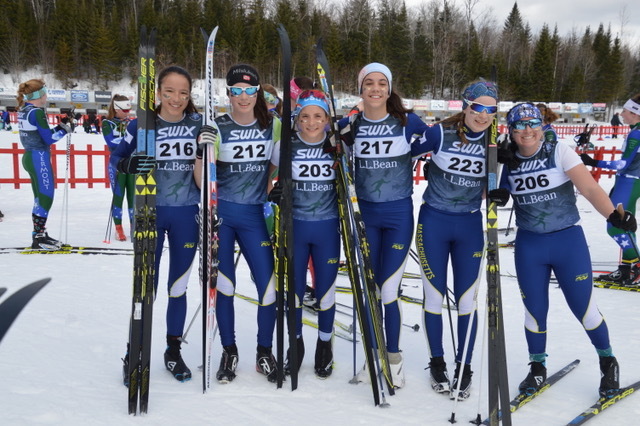 The girls had a bit more trouble on the course - at this point the slush was freezing into icy ruts, and the skiing got even more technical than it had been before. 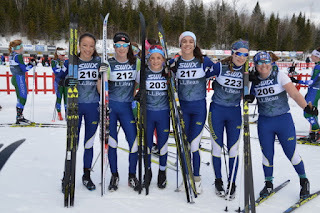 Mica took 4th, Eva was 20th, Tali 22nd, Elizabeth Anderson (skiing for CT) was 27th. We had some crashes in this race, so clearly need to spent more time making jumps and doing slalom at Weston! Sunday at EHS is one of my favorite days of the year - the mixed-technique, mixed-gender relay! The weather had changed to cold and icy, with a wind, but everyone took that in stride (heh). The boys led off with a classic leg, and Linden and Devin skied to a clear lead, tagging off to Eva and Francesca in 1st and 2nd places. Ben was about 10 seconds back, tagging off in 7th (ish) to Phoebe, surrounded by Vermont suits, and Lucas was close behind them, tagging to Flora. Patrick was maybe 30 seconds behind Lucas, and tagged off to Serena. Good clean starts by all. The first leg of the classic girls race, Francesca roared up to the lead, and held it even with a tricky corner where our skis proved to be too fast and she took a tumble. Eva was right on her heels, in a mix with a few VT teams. Phoebe skied a great leg, really strong in her stride. Flora had a great final race of her highschool career, moving up a few places, and Serena skied past a few teams as well. The next leg was skate, and Connor had another really good skate leg, closing a little on the VT team ahead of him. Ayden came back from the dead, having been sidelined with a fever on Thursday/Friday, and had a solid skate leg, and Julian was just behind, on the team with Lucas and Flora. Dwight skied well, moving his team up a few places. The final leg was exciting, and Mica skied really well, but not quite enough to hold off Abby Streinz from Maine. Tali had a solid last leg, as did Ella, skiing the 11th fastest time. Too many teams out there to list off all the results, but I was proud of all the skiing that I saw out there today - lots of hard work, glitter, and guts! A huge shout-out to John Buchheit, Terry Wong, Sheila Niedeck, Hannah Parker, and Ann Kitch for all they did to support the team - John and Terry probably put in about 48 hours of waxing and driving this weekend, with nary a complaint. WOW! A huge thank you to NENSA for putting on this event - the U16s and EHS relays are my favorite two days of the year. If you take a look at the Alaska Cup standings (which is what the various regions are vying for), you'll see that New England won the cup by 227 points - this confirms what I've been saying all year - that New England is THE fastest region out there right now, and making it to those top 6 in your age group is an incredibly difficult task, involving not just a lot of hard work, but a hefty dosage of luck. Extra big applause for Sofia, Evie, Shea, and Laura for earning all-American honors!